Comfort Zone of the Carolinas has provided outstanding heating and air conditioning services since 2005. Our owners and partners have worked in the heating and cooling industry for a combined 40 years. During that time, we’ve become the experts for residential AC repair in the Rock Hill, SC area. Call on us for all your residential HVAC repair and service needs. Every heating and air technician we employ has completed a number of training and continuing education programs. It’s how we guarantee that our company is on top of the latest developments and technology in the marketplace. They apply this knowledge on every residential service call. It’s especially handy when they’re there for routine maintenance or AC repairs. Their expertise means they can accurately diagnose the problem on their first visit. They’ll offer recommendations on the best way to fix the issue for both the long- and short-term. Although we’re a dealer for American Standard, Carrier, Mitsubishi, and Honeywell, we work on all makes and models of HVAC equipment. Why does this matter? For starters, it proves that we’re worthy of representing some of the biggest names in the heating and air conditioning industry. And we don’t just sell their products. We’ve also received many awards from these manufacturers – not just for sales, but also for extraordinary customer satisfaction. Not many dealers qualify for these honors, so we’re proud to be among the best of the best. Of course, the best repairs are the ones you never have to make. 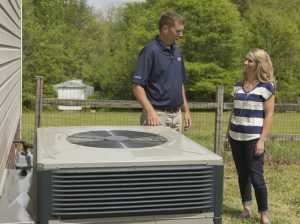 With routine AC service and maintenance, you can keep your unit in good working condition all year long. Call us for a checkup on your system at any time or schedule a seasonal service in the fall or spring. Regardless of why you call us, we offer reasonable pricing, plus special incentives to help you save even more. View money-saving coupons or learn about our financing options provided with approved credit by Wells Fargo Financial National Bank, An Equal Housing Lender. With one call, you’ll see why Comfort Zone of The Carolinas is a local name that the people of Rock Hill and surrounding communities count on. We look forward to earning your business.